Packers running back Eddie Lacy, who's listed as probable for Sunday's playoff game against the 49ers with an ankle injury, was named second-team All-Pro in his rookie season. GREEN BAY, Wis. — While the Green Bay Packers have known all week that they’d be without star outside linebacker Clay Matthews, the rest of their injury report is in pretty good shape for Sunday’s playoff game against the San Francisco 49ers. Aside from Matthews (thumb), the other five Packers players battling injuries are all probable to play. That includes running back Eddie Lacy (ankle), inside linebacker Brad Jones (ankle), defensive lineman Ryan Pickett (knee) and outside linebackers Mike Neal (abdomen) and Nick Perry (foot). "The team feels good," coach Mike McCarthy said. "I think our injury report reflects that. The guys are bouncing back and we’re going to have our best 46 out there." Lacy escaped the regular-season finale in Chicago without doing any further damage to his already twice-injured sprained right ankle. "Eddie practiced well," McCarthy said. "He practiced all week. He looks good." Jones was listed as probable heading into Week 17 but was unable to play on his injured ankle. Neal, Perry and Pickett have all frequently been on the injury report this season, but it didn’t keep any of them from playing over the final month of the regular season. A week ago, it was relatively surprising that both quarterback Aaron Rodgers (fractured collarbone) and wide receiver Randall Cobb (fractured tibia) were able to play. This week, neither is even listed on the injury report at all. Packers have two All-Pro players: The NFL announced its 2013 All-Pro team, and though Green Bay didn’t have any players on the first team, both Lacy and left guard Josh Sitton were named to the second team. "I think it’s well deserved," McCarthy said. "Very happy, very proud of both Eddie Lacy and Josh Sitton for their recognition as an All Pro. Very deserving." Sitton started all 16 games at his new position of left guard, an offseason switch that was made to get the Packers’ best offensive linemen on the left side. According to ProFootballFocus, Sitton was Green Bay’s best offensive player this season and was also the second-best guard in the NFL. "Josh, I felt that he clearly had his best year as a pro," McCarthy said. "He went to the Pro Bowl last year and I think he’s clearly one of the best, or the best, guards in the league." Lacy, a late second-round pick in April’s draft, started 15 games in his rookie season and broke several franchise rookie records. Lacy now holds the record for most rushing yards (1,178) by a rookie and most touchdowns by a rookie (11). He was the first Packers running back since 2009 to rush for more than 1,000 yards. 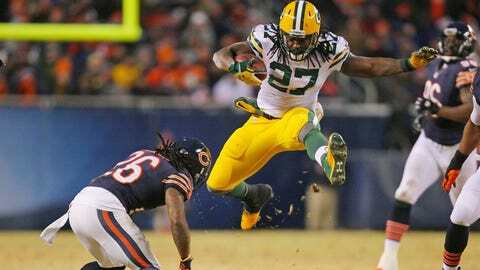 "Eddie Lacy, what an impact he’s made for our football team, especially as a rookie," McCarthy said. "We were very pleased to get the news."